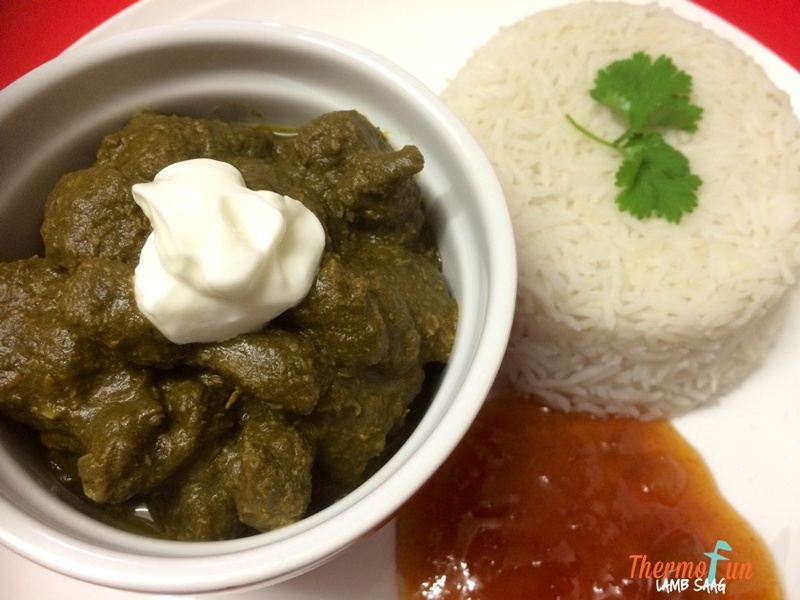 Our family loves a good curry and this Thermomix Lamb Saag is no different! You can imagine the looks I got when this was put down on the table. I had to the convince them all to at least give it a go! Grown adults and I almost had to do the “3 spoonfuls then you can hop down from the table”. Well after one they were all praises. I tell you this cooking gig is bloody hard work some days! A beautiful flavoursome filling dish with warmth but no heat. The spinach adds a delightful texture. Look past the end result and give it a go! You won’t be disappointed. Place fenugreek, fennel and ½ cinnamon stick into TM bowl and mill 1 min / speed 10. Add curry blend, garlic, ginger, chilli, coriander, lemon juice, onion, oil, salt and pepper and chop 6 sec / speed 6. Scrape down and repeat. Marinate lamb in the marinade for 1-3 hours in a container in the fridge. Wash and dry TM bowl. Place lamb into TM bowl and cook 5 mins / Varoma / speed soft / Reverse / MC off. Set aside. No need to wash TM bowl. Place spinach and oil into TM bowl and chop 1 min / speed 10. Scrape down and cook 5 mins / Varoma / speed 1. Add cream, yoghurt and tomato paste and mix 10 sec / speed 5. Add meat, curry leaves, stock and water and cook 60 mins / 90°C / speed 1 / Reverse / MC off, placing simmering basket on top of TM lid to catch any spatter. Copyright, Legal Notice and Disclaimer: Design, photography and text copyright © ThermoFun 2014-2019. Tips and tricks within are the work of the author or nominated parties who have no association with Vorwerk or Thermomix in Australia and therefore are not official, or have the approval of Vorwerk or Thermomix in Australia. None of the recipes that appear here are tested or approved by Thermomix Australia or Vorwerk. Any thoughts expressed on this site are the authors own and are not sponsored by products unless clearly stated. Any nutritional values published on this website are general indications only, for more definitive stats use the panels provided on your products. Click Here for more great recipes in a number of e-cookbooks – containing recipes to suit everyone. If you have enjoyed this recipe then please consider leaving a comment. It’s always refreshing to see comments from people that have tried a recipe and found it a success or tweaked it to suit. When do you add onion? Can you add the spinach frozen, or should it be defrosted ???? My hubby thinks he’s a curry aficionado! He thinks it’s the best curry ever. I agree! This is one of our favourites. I used half a leg of lamb and diced that up. Was way more economical then other cuts at the supermarket. Was tender and super flavoursome even the kids got seconds. Thx!! So glad you enjoyed this one Tania. I have this cooking in my thermie at the moment for a big family gathering tomorrow, thought it best to cook a day ahead for flavours to develop. My nephew is lactose intolerant so thought I would put in Zymil cream and coconut yoghurt instead of normal cream and Greek yoghurt, I’m hoping it will work out ok. Overall, a very easy and quick curry to make, given I made the marinade yesterday and marinated the meat this morning. Looking forward to tasting it tomorrow. Hi. This might seem a silly question…but can I make the curry without the meat and then add the meat later? I have fresh spinach that needs using but no lamb. Not much meat at all for that matter. By the time I get some, the spinach will be no good. Hi Emma, yes it’s certainly worth a try! Let me know how you go.